This is Debbie Price with her two fine daughters Tilly & Scarlett. 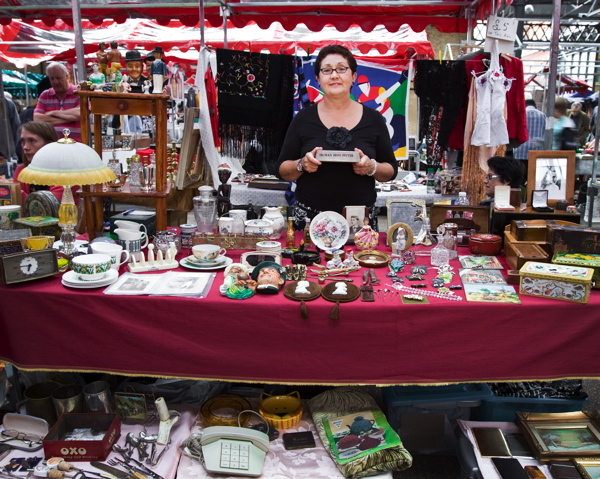 “They don’t get pocket money, they have to sell things to earn their own money,” explained Debbie – a seasoned trader who began going to jumble sales at the age of ten and reselling her finds, just as she is now teaching her daughters to do. It means that while Tilly is awaiting her exam results this week, her ever-loving mother can be reassured that even if she does not get the grades, her daughter has something to fall back on. Like mother, like daughters. This is Susan Hustwayte holding a Truman’s ashtray, a trophy of the brewery where she once worked as secretary to Mr Perkins, earning a wage of seven pounds and sixpence that she spent on fashions in Petticoat Lane each week. Susan comes from a venerable family whose ancestors include Henry VIII’s gardener and inherits her addiction to markets and collectibles from her father. “He was a demolition contractor who took me scavenging on sites when I was five years old,” she recalled with a smirk, “You should have seen his bedroom – it looked like Steptoe’s backyard!” Like father, like daughter. 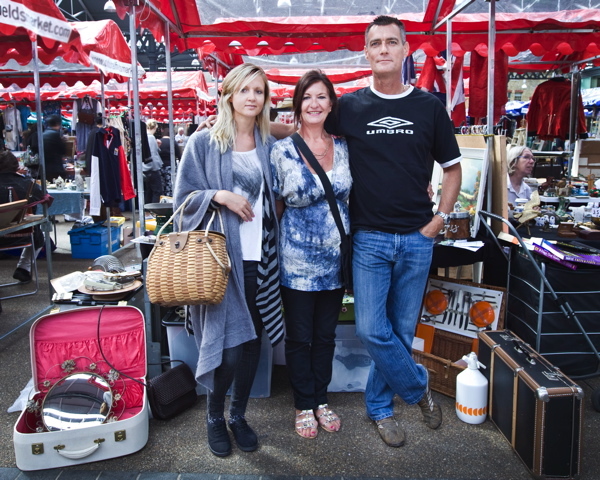 This is Catherine with her daughter Sarah, and noble boyfriend Gary who carries the boxes. “All my family are in markets, one way or another,” declared Catherine plainly, a veteran of fifteen years of car boot sales,“My parents started off with a stall and I worked for them as a little girl.” Now Sarah has started trading too, showing her mother some moral support, “I’ve been helping my mum for years and I decided to give up my office job and go independent selling clothes,” she admitted shyly. Like mother and boyfriend, like daughter. 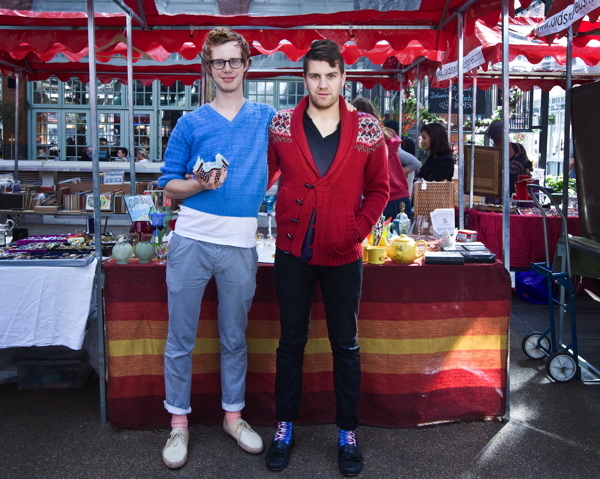 This is glass dealer Sarah Ovans‘ son John Ovans, who with knitwear designer Morgan Allen-Oliver also deals in glass. “Sarah’s house is like a showroom with all this glass everywhere, priced for sale,” revealed Morgan with a coy grin. “Her taste is sophisticated and grown up, whereas our stall is like a sweetshop!” he added, exchanging a knowing smile with John as they happily gestured in unison at their multi-coloured glittering display. Like mother, like son and boyfriend. My daughter who has a stall (ephemera) at the market told me about your blog. I am currently in France and have just picked my blackberry crop. Sloes have been located but it’s still too early to pick them and rose hips, better after the frosts. Have recently picked all the greengages on my tree and am currently picking buckets of lovely smallish purple plums – the ones with the whitish purple bloom on them.Am freezing a lot of these on trays before bagging up, the rest I boil with a little brown sugar and eat every day with plain organic yoghurt. The blackberries greengages, and purple plums in the freezer will last the whole year. I have apples to come, I pick these from the ancient trees in the field hedges then put them on trays eating them throughout the winter. They are much sweeter when they get a bit wrinkled! There will still be walnuts and the chestnuts to come! I live in France, the Limousin, all summer, then in Northumberland all winter.I was born within the sound of Bow Bells. 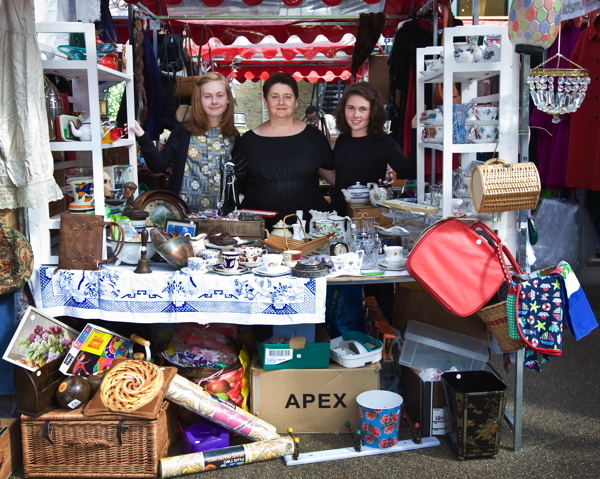 Was at the Spitalfields’ Market last Autumn where I visited my daughter’s stand and bought some lovely antique curtains. I am a long time dealer in decorative antiques, and an artist.